Remember those silly high school superlatives that seemed so important back in the day? Poring through the year’s most famous wedding photos is kind of like that - you're instantly thinking things like, “Sofia definitely has the best smile,” and “Cameron Diaz totally wins for best musical taste,” and “Johnny is absolutely the most baller guy with his own island,” and the list goes on. 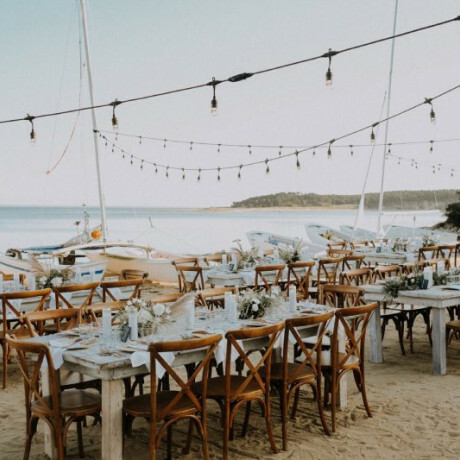 But if you pay close attention, what you really start to notice is how much personality plays a role in the venue selection for each of these wedding celebrations. 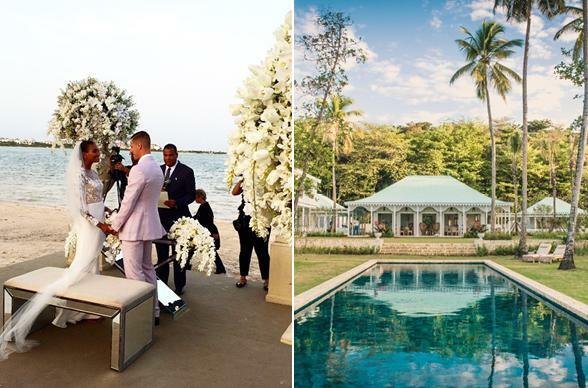 We've hand picked celebrity weddings from all around the world, some with venues anyone can book and some with pretty awesome alternative spaces. Across the board, it seems that in 2015, Mother Nature takes a starring role in the majority of A-list weddings, with privacy being major concern number two. While we can't say which wedding is the all around class favorite, we can probably still take votes! 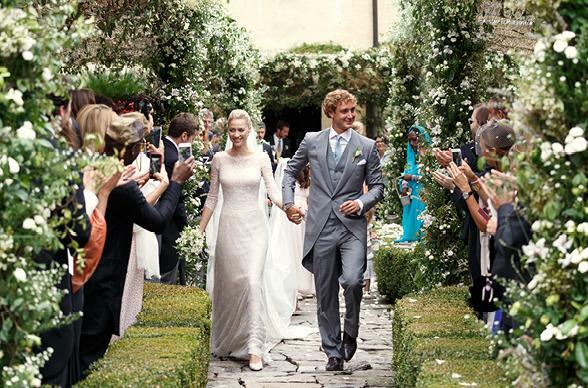 Monaco’s royal wedding of Pierre Casiraghi (grandson of the Princess of Monaco) and Beatrice Borromeo took place at the Borromeo Castle in July and was nothing short of a fairytale dream come true. Located on its own island off the coast of Italy, this 17th century palace is like a movie set. Great news is that it’s not exclusive to the Borromeo family. You too can tour this epic setting, if only you can figure out how to cross the moat! 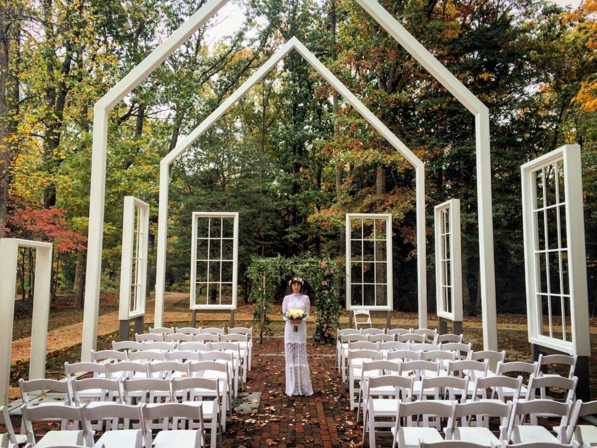 In October, singer Jason Mraz and his lovely lady Christina Carano officially said, “I’m Yours,” to each other at Pole Green Historic Church, a cool conceptual outdoor space in rural Virginia that features a church frame and floating windows. Guests were surrounded by fall foliage and certainly no shortage of romance in the air. 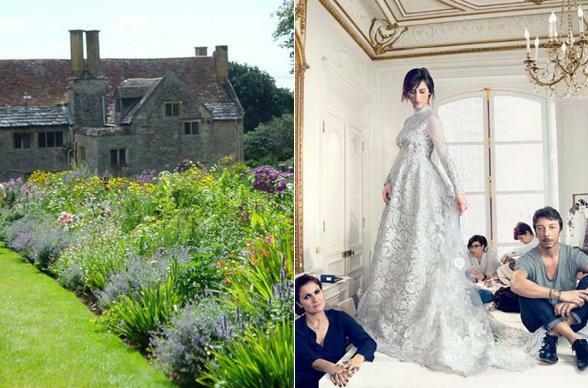 Guy Ritchie’s July wedding to Jacqui Ainsley took place in the perfectly pruned gardens of their English country home (left image). 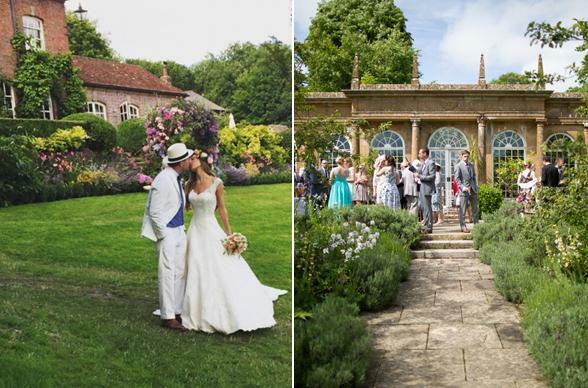 While Mr. Ritchie probably wouldn’t want us scrounging around his property to throw a surprise wedding bash, we’re willing to bet he might be a fan of the gardens at Mapperton (right image). 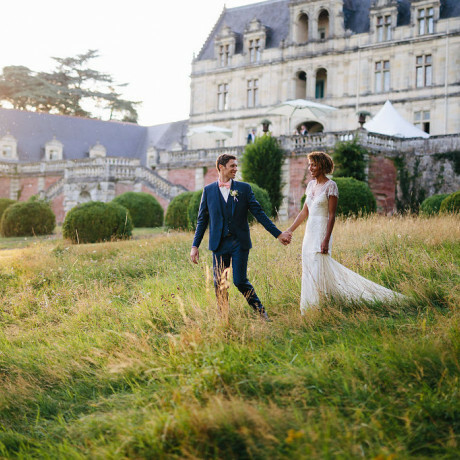 The Dorset country manor is a close runner-up to the romantic setting of Ritchie’s blissed out wedding. Ever since her days on The Hills, we’ve been major fans of Whitney Port’s impeccable style. Her November wedding to Tim Rosenman at the Colony 29 in Palm Springs was that perfect combo of romantic and modern that she’s known for. 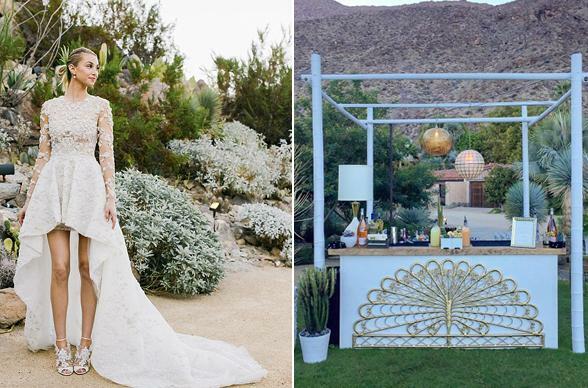 Not only was her dress insanely gorgeous, but the backdrop at the Colony 29 just screams desert chic. 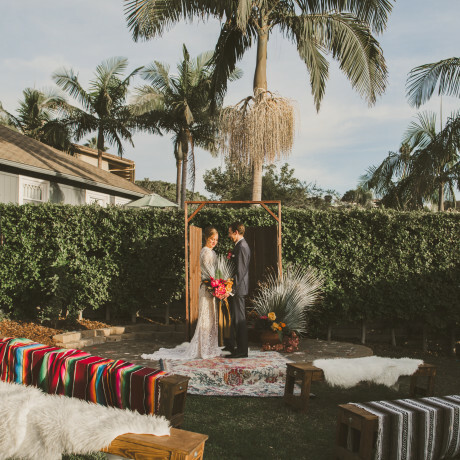 Love the way she brought in tons of palms and greenery to embrace the setting! 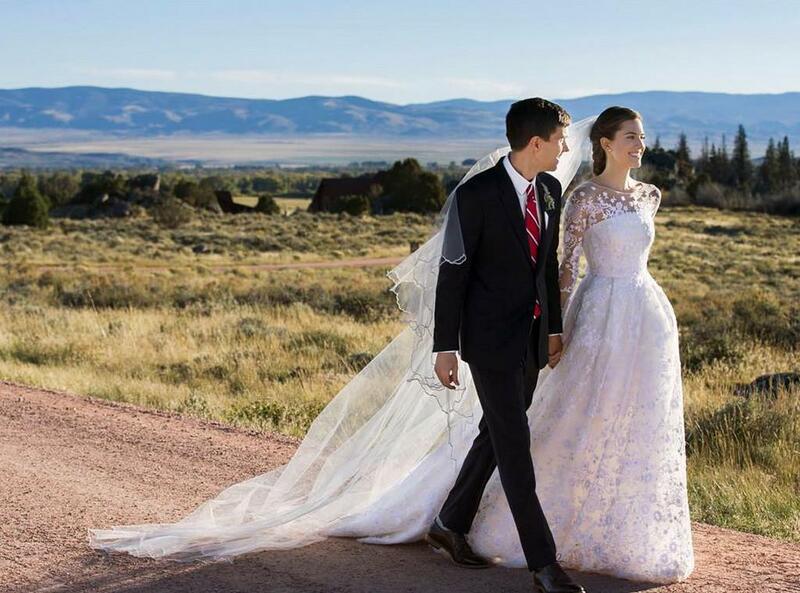 Everyone’s favorite HBO's hit show Girls crush, Allison Williams, tied the knot with College Humor co-founder Ricky Van Veen at the Lodge at Brush Creek Ranch in Wyoming this past September. The ranch wedding was officiated by Tom Hanks with guests like Katy Perry, Lena Dunham, John Mayer, Diane Von Furstenberg and Bruce Springsteen in attendance. Located at the base of the Sierra Mountains, this 30,000 acre ranch is the epitome of luxury lodging in the middle of the American West. 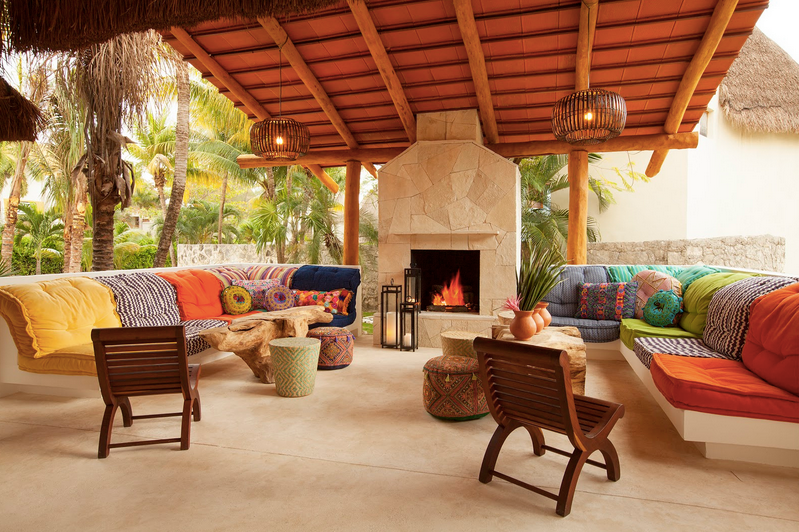 Rustic and luxe at the same time, this fabulous resort feels like you've stepped into a Restoration Hardware catalog. 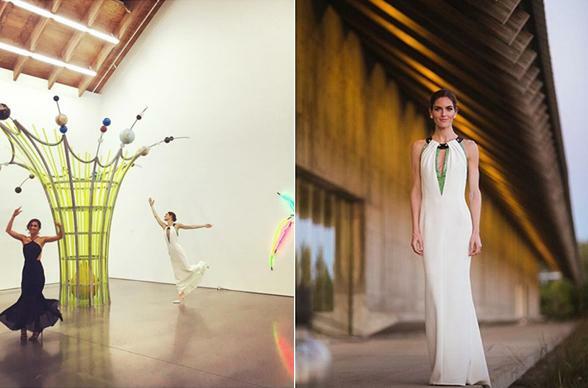 Model Hilary Rhoda practically broke the Internet with her amazing Carolina Herrera wedding gown back in September. The statuesque glamazon wed pro hockey player Sean Avery at Long Island’s East End Parrish Art Museum. The modern structure looks out onto 14 acres of fields and wildflowers, providing a stunning natural backsplash. 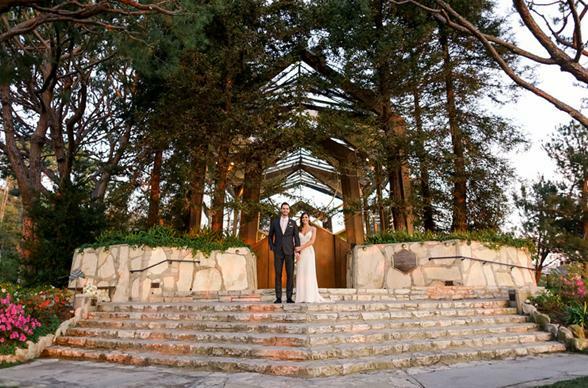 In February, Bachelorette TV couple Desiree Hartsock and Chris Siegfried exchanged vows at the Wayfarer’s Chapel and invited guests to dinner at the Redondo Beach Historic Library. The space is romantic and feminine, with beautiful views of the bay. The sweet duo brought in one of our favorite rental companies, Found Rentals, to soften up the space and a little extra charm. Wonder if they tucked any roses into her bouquet! Victoria’s Secret model Kate Grigorieva married longtime boyfriend Alexander in St. Petersburg, Russia in August at a quaint little church. Similar in architectural style and only half the amount of time spent traveling from the states, Ellenborough Park in Cottswald, England could be an amazing alternative for a timeless manor as your wedding backdrop. There’s even a sweet little chapel on-site with gorgeous hardwood floors, tall white ceilings and the perfect amount of sunshine pouring in. 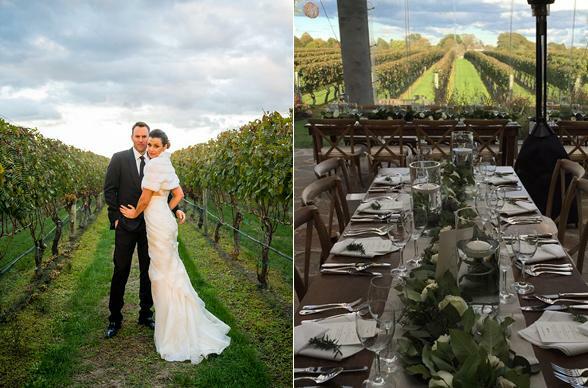 The flawless Bridget Moynahan walked down the aisle with businessman Andrew Frankel in October at Wolffer Estate Vineyards in the Hamptons. 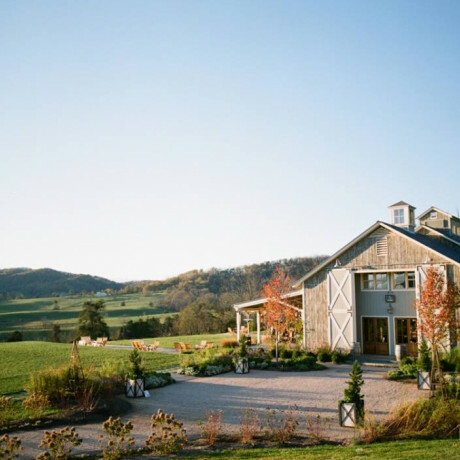 Set amidst rolling vineyards, the venue is perfect for a fall wedding backdrop and has options for indoor or outdoor dining and plenty of space for a tent if one was so inclined. For those who can’t make it to the Hamptons for a wedding, the little cider bottles Wolffer sells are an adorable welcome bag addition with a pretty, colorful label! 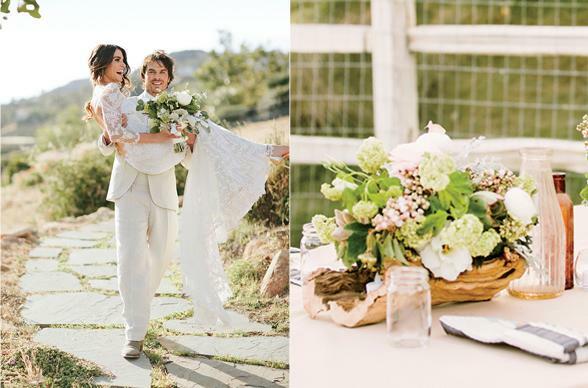 Topanga Canyon’s Tuscali Mountain Inn was the venue of choice for eye candy couple Ian Somerhalder and Nikki Reed. These two beauties tied the knot in April, embracing a boho-chic aesthetic. The Tuscali Mountain Inn is totally down-home and accessible, a great place to host any kind of getaway with friends and family. The real show stopper in this scenario is Mother Nature – everywhere you look there are mountains and trees tugging at your heart strings. Summer along the Amalfi Coast proved to be pretty romantic for Disney star Alyson Michalka and her now hubby Stephen Ringer. 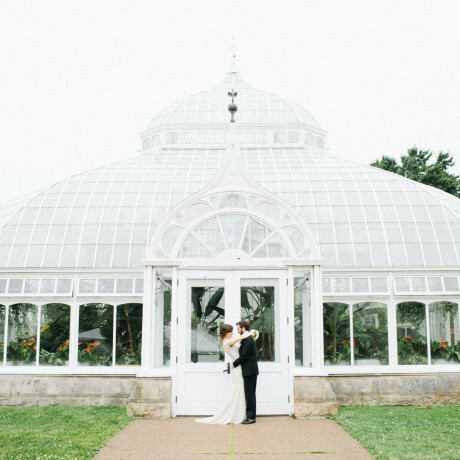 Alyson even tweeted a sneaky message about the venue just months before the wedding "....And my fiancé just found the best location and weekend experience for our wedding guests. 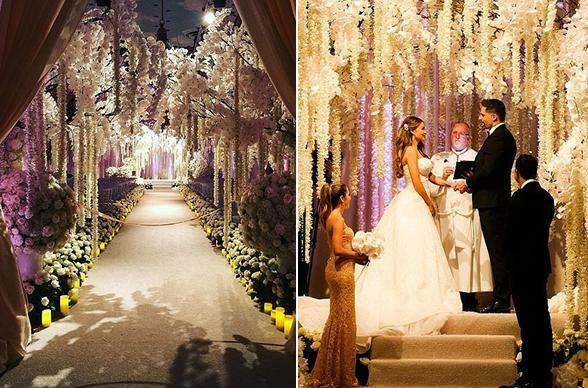 #wow #dreamwedding". The two later wed in early June at the dreamy mystery location, Belmond Hotel Splendido in Positano.This glamorous Italian resort is best known for its gardens and picturesque views of the port below. For a smaller crowd, check out the 11-room sister hotel Splendido Mare, equally chic but a bit more intimate. Jamie Chung and Brian Greenberg, who star in the movie Already Tomorrow in Hong Kong together, kicked off their Halloween wedding weekend with a Boos and Booze costume party in the woods. 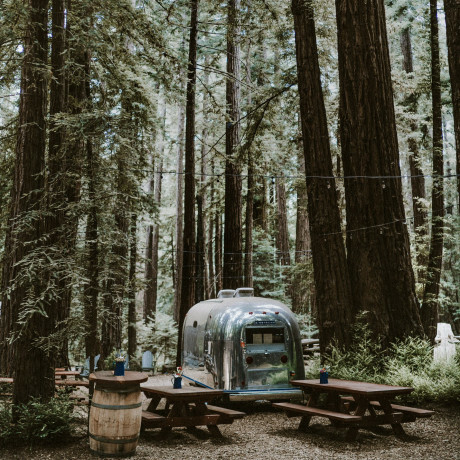 Both lovers of the outdoors and a little bit of glam, their Santa Barbara wedding at El Capitan Canyon on the coast was surely a relaxing getaway for all the guests staying at this collection of safari tents and log cabins. While we were unable to snag an actual photo of the nuptials, this image by Josh Gruetzmacher looked very similar to Jamie and Brian's big day. 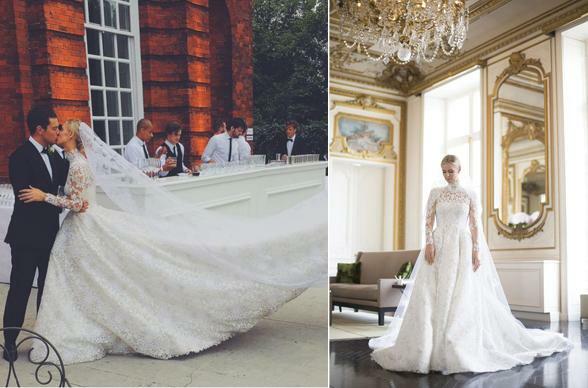 In July, hotel heiress Nicky Hilton and banking heir James Rothschild celebrated their wedding in a storybook setting at London’s Kensington Palace. 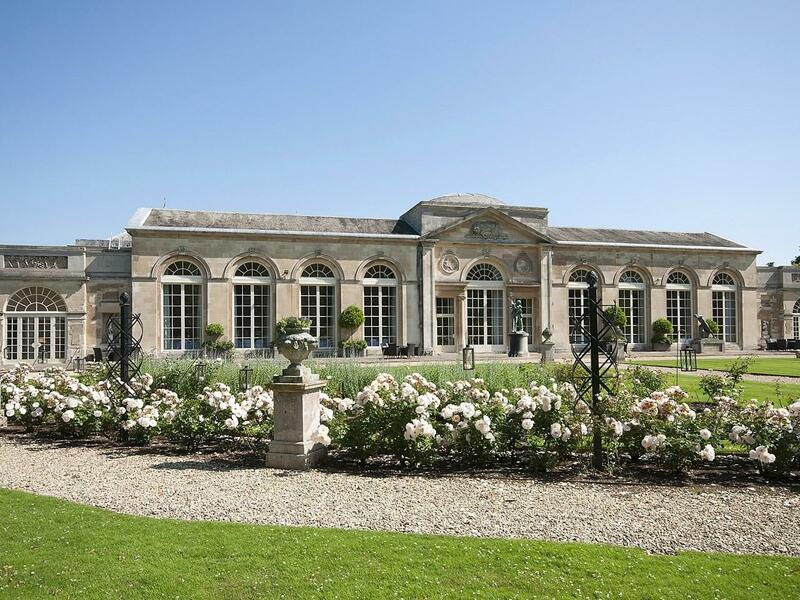 Surrounded by historical gardens, the Orangery at the palace is a London favorite for brunch or afternoon tea and the building doubles as a beautiful, sun-filled event space. Fair warning, you may want to brush up on your etiquette before stepping foot inside! 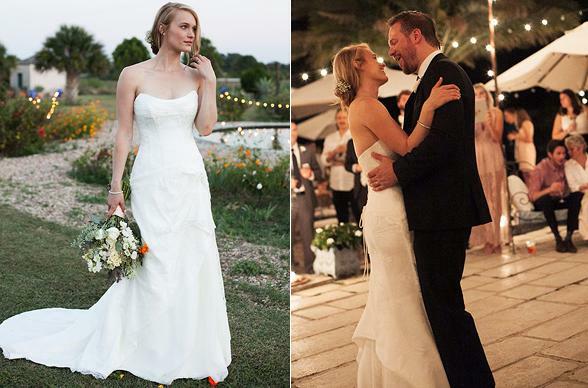 True Blood fans had their hearts crushed in October when Hoyt – ahem – Jim Parrak married Leven Ramblin at Texas Hill Country estate El San Michele, just outside of Austin. 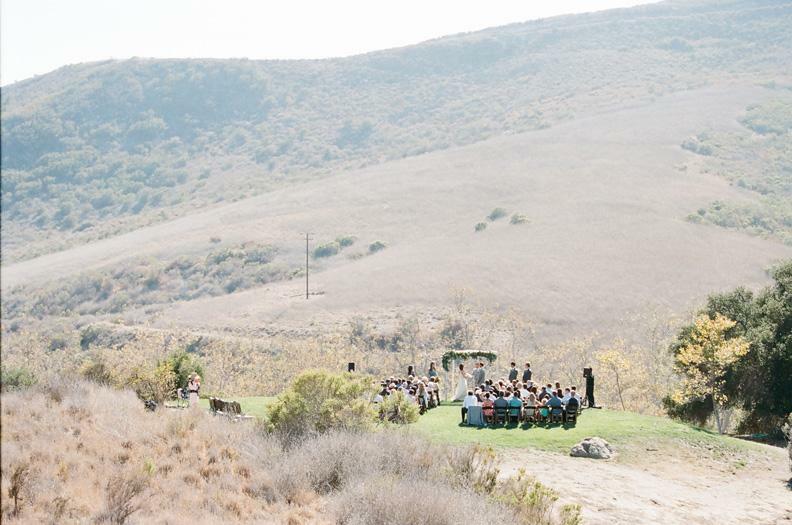 The property’s stone farmhouse sits amidst rolling hills and European gardens, making every outdoor spot the perfect ceremony location for sun worshippers (read: no vampires allowed). In an unsurprising turn of events, everyone’s favorite detective, Benedict Cumberbatch, married actress and director Sophie Hunter on Valentine’s Day. The scene of the crime was drop-dead gorgeous, with the location being the 12th century medieval Church of St. Peter and St. Paul on the Isle of Wight, England’s largest island. The nearby reception was hosted at the island’s 16th century estate, Mattisone Manor, which is available for private event bookings through the National Trust. The grounds feature impeccable gardens, art collections and a bevvy of history of the local landscape. 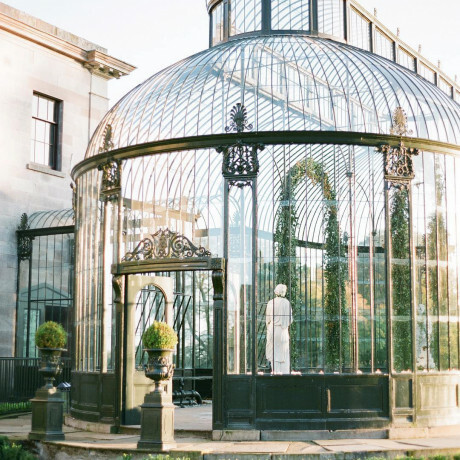 If ever you dreamed of a secret garden wedding, this would be the place to have it! 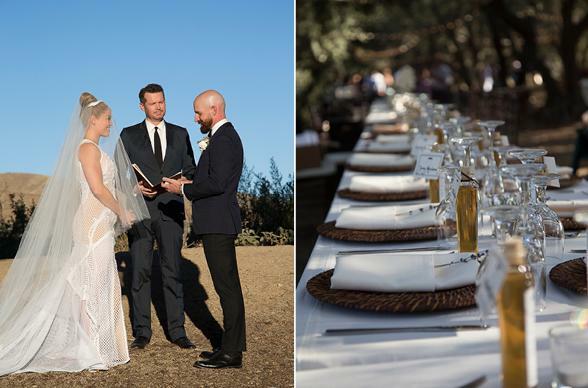 Leave it to Jennie Garth to host a summer wedding to beau Dave Abrams at her own 6-acre ranch in Los Olivos! 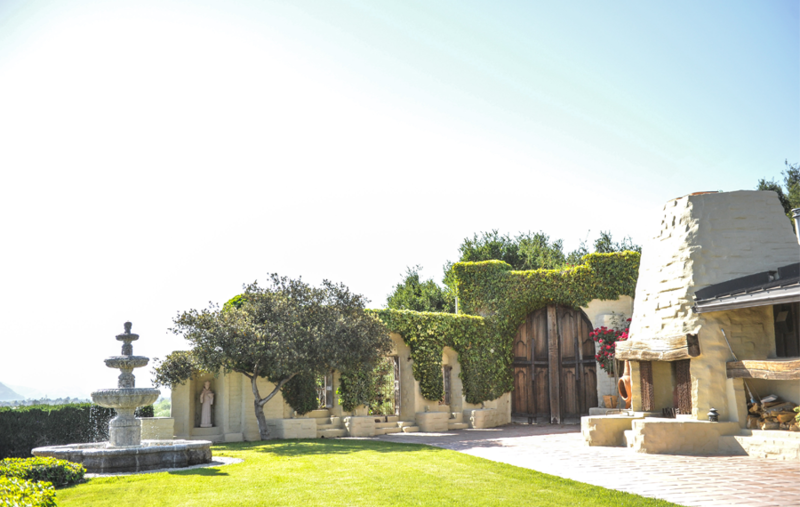 While you may not own your own ranch to throw such a bash, look no further than to Whispering Rose Ranch in Solvang, CA (only a few miles from Los Olivos) to swap vows in a beautiful garden setting just like our favorite 90210 star. We’ll leave the search for the perfect floral gown up to you. Vows under ancient oak trees and dinner in an olive grove? Sign us up to be guests of the next Highland Springs Resort wedding! In early September, Erica Christensen and her guy Cole Maness treated their guests to a lovely evening under the stars at this outdoor venue in Cherry Valley. With fields of lavender and organic farms all around, this resort is one any free spirit with a love for nature would be envious of. Continuing along the path of breaking Victoria’s Secret fan hearts, model Arlenis Sosa celebrated a May wedding (left image) to basketball player Donne MacGrath in Punta Cana, Dominican Republic. 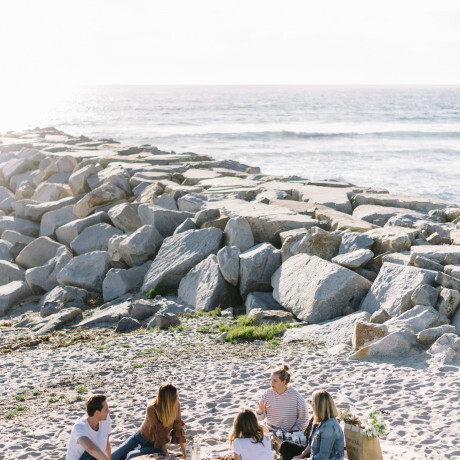 While these two lovebirds were lucky enough to use a friend’s beachside villa, rest assured we have an alternative venue that’s just as worthy. Nearby Playa Grande Beach Club (right image) is an adorable collection of bungalows that are fit for a fête of epic proportion. Love the quaint Caribbean vibe of this place! 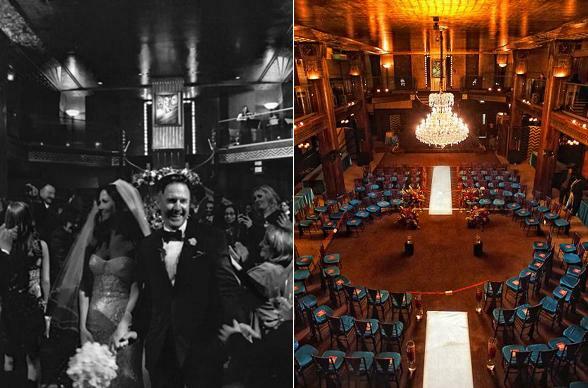 Maybe your backyard isn’t complete with a huge wooden deck or enough space for a tent, but we bet you could throw a wedding our girl Jennifer Aniston would be envious of at one of her favorite hotels, the Sunset Marquis Hotel in West Hollywood. Rumor has it that Jen and Justin Theroux invited guests to a birthday party at their home on a summery August evening and instead ended up surprising guests with a wedding. Sunset Marquis has a pretty amazing pool deck and we’re willing to bet a surprise wedding would go off without a hitch at this trendy hotspot. April proved to be a lucky month for actor David Arquette, tying the knot with entertainment host Christina McLarty at Italian restaurant Cicada in Los Angeles. 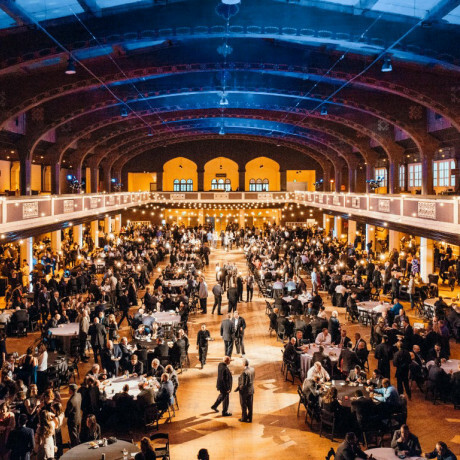 With its art deco design, soaring ceilings and drippy amazing chandeliers, the interior space is an awesome spot for a late-night party where anything goes. Ever the private celeb, Cameron Diaz didn’t even tell her besties she was getting married until they showed up to her gorgeous Los Angeles home and she walked down the aisle to say “I do” to her main man, Benji Madden. 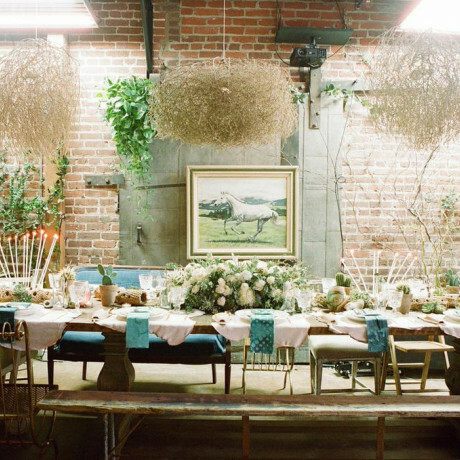 The creatively brilliant duo held their wedding in January under the guise of a dinner party and decked out the house for ultimate privacy. 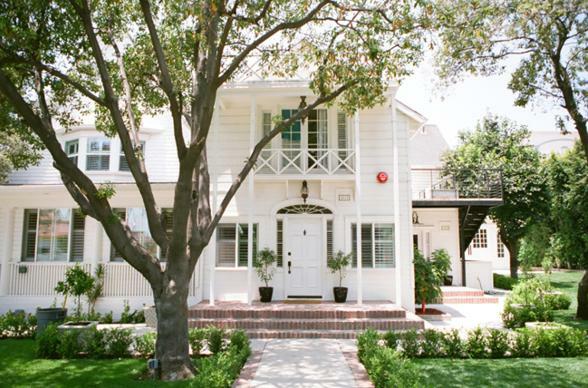 If you’re aiming for that super cozy, intimate vibe but can’t fit 100 of your nearest and dearest in your house, check out the Lombardi House (image left), a victorian style farmhouse with a modern aesthetic. Now the trick is booking Ryan Adams and Lionel Richie for the reception! Tina Knowles & Richard Lawson - On a Boat! 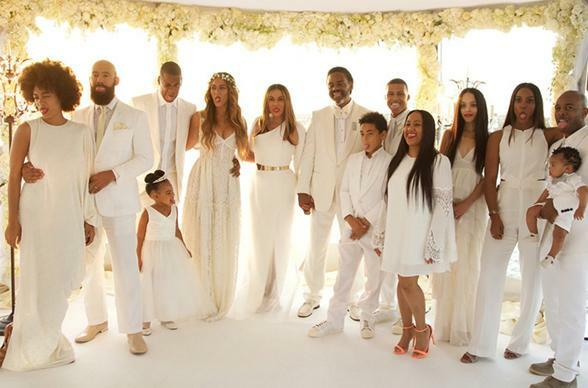 Taking a nod from daughters Beyonce and Solange’s weddings, Tina Knowles made sure guests were decked out in white for her own wedding on a yacht. 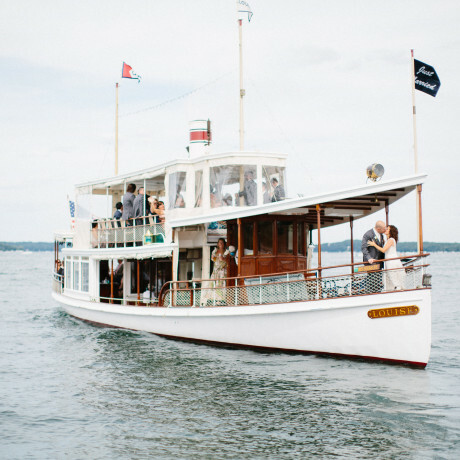 Tina and now hubby Richard Lawson opted to have their closest friends and family hop aboard a boat last April to celebrate their vows. Just when we thought we couldn’t be more obsessed with Solange’s venue choice of the Marigny Opera House in New Orleans, Mama Knowles had to go and step it up to a yacht! For those lusting after a nautical approach, hop aboard the pristine white Zambezi Queen in Cape Town, Africa. Hey, a girl can dream! While most of us would prefer to pretend this wedding never happened and our dear Johnny Depp would be a bachelor forever, he did in fact marry the beautiful Amber Heard in February on their own private island. Lesser-known fact about Mr. Depp is that he was once great pals with Marlon Brando, who also owned an island, his on French Polynesia. Accessible via private plane, the Brando (right image) is a contemporary, tropical resort with 35 beach villas located about 30 miles north of Tahiti. Something gives us a feeling Johnny would approve of this private, exclusive beach haven. Scottish tennis pro Andy Murray wed longtime girlfriend Kim Sears in Dunblane, Scotland on a blustery April day. 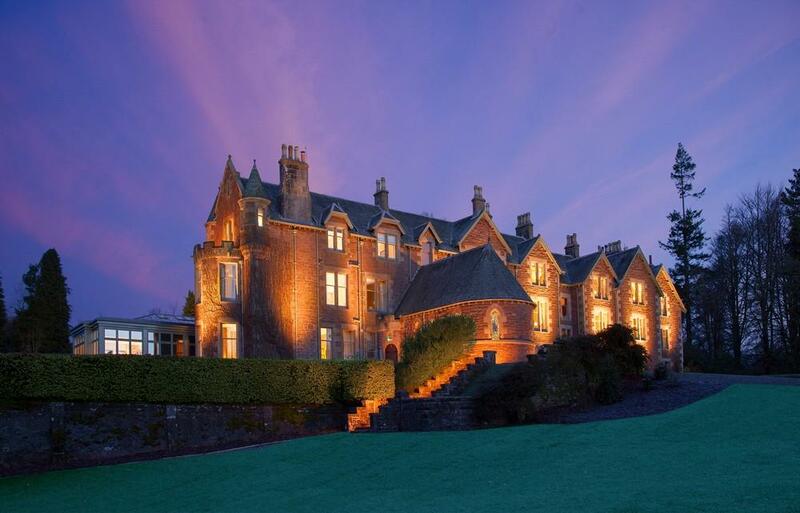 The pair got married in the Dunblane Cathedral, which dates back to the 12th century, and followed the ceremony with a reception at the Cromlix Hotel (pictured) Both venues provided a traditional, timeless backdrop that was entirely representative of the historic area of Scotland where the wedding took place. For those looking to recreate a royal wedding, look no further than this sweet little Scottish town. 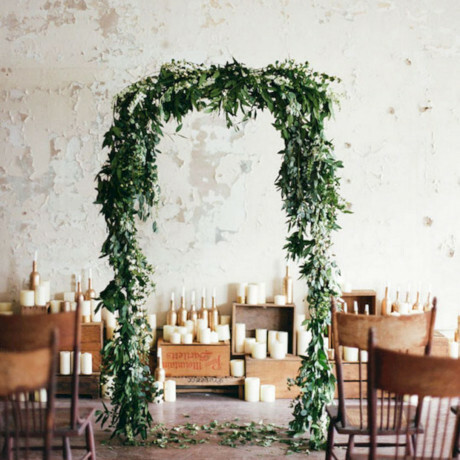 Secret garden weddings are all the rage right now! 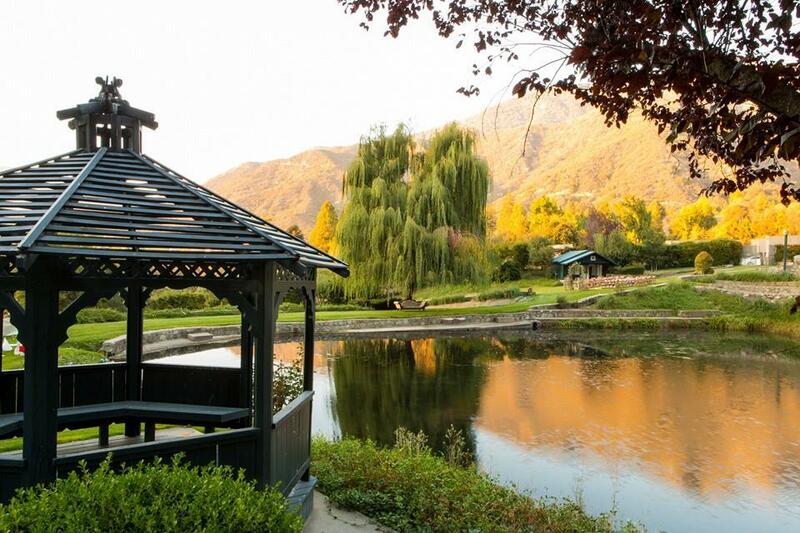 Celebrity dynamite duo Mila Kunis and Ashton Kutcher threw a Fourth of July wedding in the secret garden at Parrish Ranch in Oak Glen and it could not sound more magical. Guests were treated to fully loaded luxury tents and got to sleep among the apple orchards, ponds and botanical gardens on site. The couple dubbed the venue, "Camp KuKu" and set up fun activities and rows of luxe tents with a campground vibe. If you happen to be hunting for a luxe tent camping experience, Shelter-Co. is the ultimate go-to and they’ll set up just about anywhere you can fit a grouping of tents. Did we mention they have camping butlers for hire? Is there anyone who doesn't love Sofia Vergara and Joe Manganiello as a couple?! The adorable pair decked out The Breakers resort in Palm Beach, Florida for their over-the-top glamorous wedding in late November. To say that the venue was dripping in flowers is a vast understatement! In defense of the ballroom at The Breakers, it's a really pretty and modern space that doesn't need nearly this much décor to sparkle, but Sofia gets what Sofia wants! With her Spice Girls days long behind her, Geri Halliwell wed beau Christian Horner in May at St. Mary’s church in Woburn, Bedfordshire followed by a party at the stately Woburn Abbey and Gardens (pictured left). Set on 28 acres of land, the wildlife and gardens at the abbey are unforgettable. Weddings here typically take place in the sculpture gallery, a room with massive ceilings and floor-to-ceiling windows, flanked by giant marble columns. Insert heart-eyed emoji here! Considering a destination wedding? Take a peek at country singer Jason Aldean and professional dancer Brittany Kerr’s wedding at Mahekal Beach Resort in Playa del Carmen, just south of Cancun. Their March wedding took place at a resort that was super easy for guests to get to with Cancun having direct flights from NY, LA, SF, Nashville, Houston, and more. Colorful, comfortable and casual were the inspiration hot words for their big day and having the Caribbean Sea as their backdrop certainly helped to accomplish all those goals! The Internet was up in arms over Mary-Kate Olsen and Olivier Sarkozy’s December wedding in New York, which reportedly featured bowls upon bowls of cigarettes as décor. Fear for all their guests’ lungs aside, their wedding was an intimate celebration held indoors at a private residence with a small urban garden space. See, when you take the cigarette consumption out of the equation, it sounds like quite the chic affair. 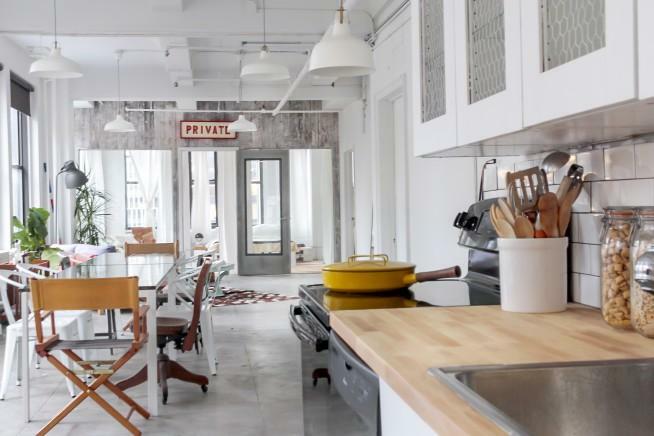 A small loft space with tons of airy sunlight, Manhattan’s Witness Apartment (pictured left) would be a fitting alternative for those looking to host an intimate dinner party in a setting that's got that authentic New York vibe. While there's no outdoor space, the views of the Manhattan skyline are unbeatable and smoking is in fact permitted!